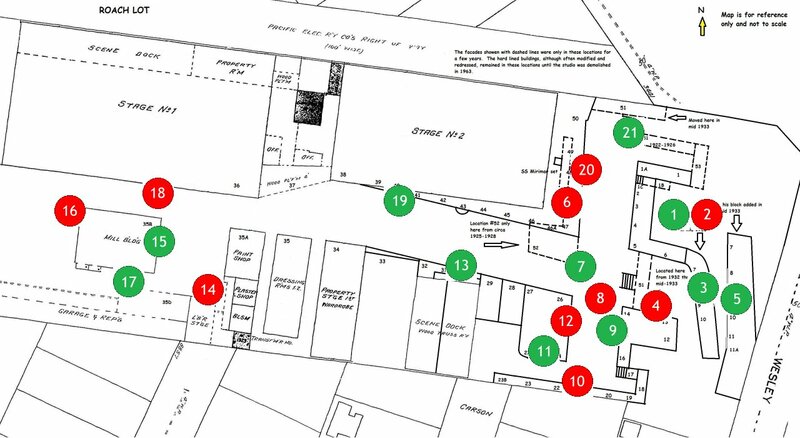 This project aims to show you the shooting locations of many of the films on the Hal Roach lot, using a numbered-labelled grid to correspond with the screenshot. The first map is split into twenty-one areas, all of which are accessible by clicking on a numbered button from any page. The second map is "Beyond The Back Lot" and is a further fourteen sections. For reference of which number represents which location, please refer to this main menu page and the diagrams below. It is designed to be a "tour" of the Roach lot, beginning in the top North-East corner and working its way around in a clockwise manner and revealing screenshots from a number of films in a carefully constructed geographical order. The screenshots theoretically run in approximate order according to the grid, so it is as though you are physically walking along the street and seeing the buildings in the correct order. You will note that each screenshot contains numbered markings to identify buildings which correspond with the map. Below, each building on the lot is marked with a corresponding number and a list of all known films shot at each location is listed in detail. The images on these pages have been compressed to make them fit onto the page. You can view the full image by right-clicking your mouse on the picture and saving it to your computer, where you will be able to open it at its full size. Alternatively, you can always contact me lordheath1972@yahoo.co.uk and I can either pass on any information, or correct anything site-related. Special thanks to Marc Wanamaker/Bison Archives for the use of several images herein. MAP OF THE ROACH LOT, REPRESENTED BY NUMBERED LOCATIONS. The numbers shown here in BOLD represent the numbers on the map diagram and NOT the red & green circled numbers (these are for PAGE references only). In other words, please refer to THIS MAP. 1A. Three story tenement with brick facing. Constructed circa 1922, remained in place until circa 1926. 1B. Three story tenement with brick facing. In place 1922-1926. 1C. Triple flight of wooden stairs on south end of #1B. Later removed circa 1926 and reinstalled at location of #17 (see #17 listing for subsequent history). 1. First set: Two story set with shop on ground floor, facing west. In place 1926-27. 1. Second set: Formerly located at #47-48, replaced at site #1 circa September 1928. In fall 1931 this set underwent renovation; the brick facing was replaced and the store front slightly modernized with larger windows. 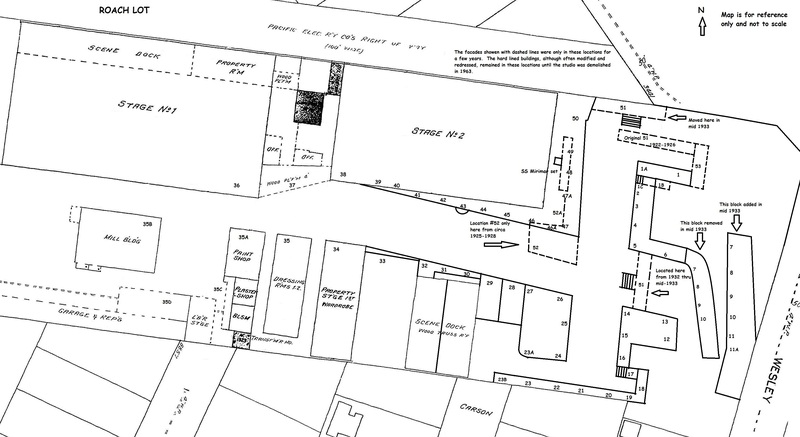 -New set comprising #7 through 11A constructed circa August-September 1933 approximately 20 feet to east of former #7 through 10 facades, along Wesley Avenue boundary of studio property. -Remodeled in 1933 with art-deco façade as with #7: new facade comprised four glass-fronted doors and on second level a vertically paned window divided by three mullions. -brick storefront (You’re Darn Tootin’, Jan. 1928). -Subsequently remodeled and enlarged with an art-deco façade, 1933. At this time the structure comprising #s 12-13-14 was given four entire sides, a roof, and soundproofing so as to be used for interior as well as exterior filming. 15A. Frontage below street level accessed by steps leading downward on right side of façade. 16. Light-colored brick storefront with 2 upper levels. 17. Three story flight of wooden stairs on exterior of #16. Originally situated at #1C (see previous listing), and moved here circa 1925. -Alley with door at basement level of building at dead end of alley (Below Zero, Feb. 1930; The Pooch, March 1932). -Unmarked door (Below Zero, Feb. 1930); bricked over subsequent to 1930. -Bay window on second level above storefront. -On corner post: mailbox on post (The Battle of the Century, Oct. 1927). Post but no mailbox (You’re Darn Tootin’, Jan. 1928). No post present, 1928-1933; mailbox post (Oliver the Eighth, Dec. 1933-Jan. 1934); traffic light (The Lucky Corner, May 1935). -Alley to right of The Pink Pup [q.v. listings for #23 and #52] (Putting Pants on Philip, Sept. 1927). Subsequently filled in by a standing set circa late 1927: building front with tall two-storey gothic-style arch in which is set double doors flanked by twin narrow multipaned windows. -Second floor level: apartment with large window and ledge (A Pair of Tights, Sept. 1928). -False brick façade constructed over the Hal Roach Studios Property Storage building circa 1931. Church (Too Many Women, Feb.-March 1932; Birthday Blues, July 1932). Subsequently removed some time after 1934. -Hal Roach Studios Wardrobe Department and Property Stage building. (Sons of the Desert production shots, Oct. 1933; Nurse to You, early summer 1935; Swiss Miss production shot in color, early 1938). 35. Hal Roach Studios Dressing Rooms [for featured and day players]. 35A through 35D. Hal Roach Studios Construction/Property Dept. Seen as National Lumber Co. (Busy Bodies, July 1933). The shed destroyed by the falling ladder was constructed in the open space between 35A and 35B. There was 65 feet of open space between these structures. 35A. Hal Roach Studios Paint Shop. 35B. 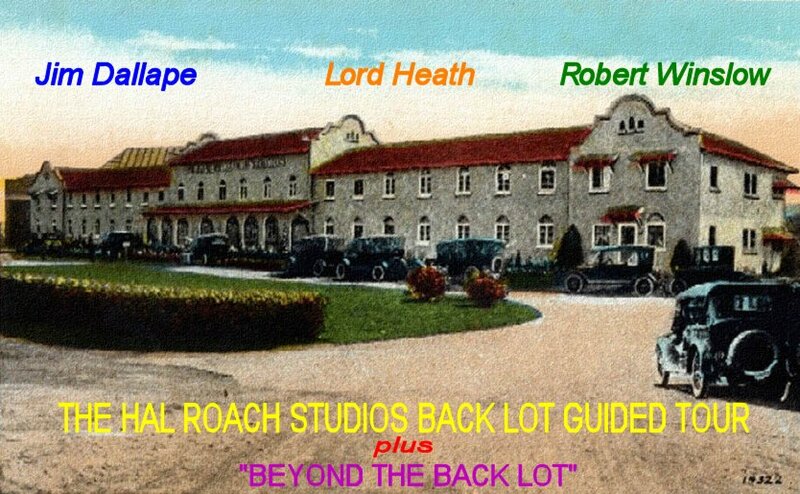 Hal Roach Studios Mill Building. The building into which Stan and Ollie walk in Busy Bodies (July, 1933). Replaced circa 1936 by Sound Stage 5. 35C. Hal Roach Studios Plaster Shop and storage building. The tall square structure seen to its rear, connected by multiple electrical wires to an electrical pole with transformer, is part of the transmitting apparatus for radio station KFVD. 35D. Hal Roach Studios Garage and Repair Facility. 36. Hal Roach Studios Stage One (containing Sound Stages 1 and 2). The first stage constructed on the Roach lot in 1920; originally open to the sky with muslin reflectors, the structure was roofed over by 1922. Exterior and interior seen as part of West Coast Studios (Dogs of War, Feb. 1923) as part of army recruiting base and parade grounds (Pack Up Your Troubles, May 1932) as background of depot (Strange Innertube, July-Aug. 1932) as Baggage Room exterior (Thundering Taxis, early 1933) as exterior wall of sawmill with flue in which Ollie gets stuck (Busy Bodies, July 1933). Stage One was roughly 200 feet long (east to west) and 100 feet wide (north to south). The side nearest National Blvd. was reserved for storing scenery and props. 37. Hal Roach Studios Loading Dock / Casting Offices for extras and day players (Dogs of War, Jan-Feb. 1923). The loading dock, a raised wooden platform, connected Stage One with Stage Two (#38). 43. Unmarked storefront with tilework sills in checkered pattern beneath windows to either side of entrance. 51. Brownstone façade with steps. Originally placed in intersection between #s 5 and 14 circa March-April 1932. -Removed to position at northwest corner of “Brownstone St.” circa August 1933. 52. Three storey brick front at right angle to Main Street, with western frontage on a parallel line with the alley running between #27 and # 29. -Subsequently removed during renovations to the set frontages along Main St. in approximately Sept. 1928. -Alley tenement (Hot Heels, 1922; Stage Fright, Feb. 1923; It’s a Gift, 1923; Big Red Riding Hood, 1924). -This set was still in place as late as Sept. 1927 (its shadow can be seen cast on #s 8-9 in Putting Pants on Philip, Sept. 1927). Removed circa late 1927-summer 1928. The project is primarily screenshots takes from various films. There are a small handful of photographs included in this project, which are strictly for illustrative purposes. It is not my intention to infringe upon any copyright of these images, and would gladly acknowledge any copyright status held by the rightful owner of said images which have been used herein without their prior consent. Please contact me if you feel any such violation has taken place. Although I did not undertake this project, I shall accept full responsibility for the publication of such on this website. All images may be subject to copyright (see Disclaimer above).